Life is short, go nuts! Waking up late on Saturday means not having many options for breakfast, especially when it’s already afternoon. Luckily, after googling around a bit, the missus and I found Food for Thought at the Singapore Botanical Gardens which serves breakfast all day. It’s situated near the Tanglin entrance to the Gardens. The taxi driver took us to the wrong gate, so we had a good 15 minutes walk from the Naseem gate back to the to the Botany Center where the eatery was. Nothing like getting lost to work up an appetite! It’s certainly a very peaceful and relaxing place, and the food did not disappoint. We ordered bangers and mash for two, and it was actually pretty nicely done. 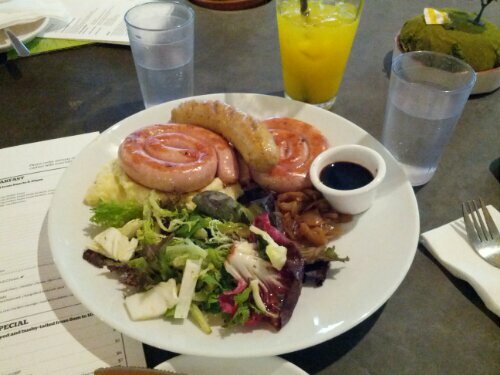 Very flavorful and juicy spiral pork sausages and chicken sausage. The creamy mashed potato complemented the meat quite well. The orange juice was exceedingly sour though, so we’ll probably ask for something else next time. This entry was posted in Food on March 16, 2013 by Wei Chiang. Yes! Intel NUC 8i5BEH accepts 64 GB RAM!